As was so well-chronicled and documented by the January 2016 issue of the Spiritual Sword, denominationalism is indeed on the decline. This, as many are apparently growing sick and tired of the surface, shallow, ‘driven about by every wind of doctrine,’ spiritual teaching and preaching they are receiving at most man-made and never found in Scripture denominations they are now attending (See: Ephesians 4:11–16; 2 Timothy 3:14–4:4). Many who are hungering and thirsting for more biblically righteous, accurate, and meaty messages (Matthew 5:6) which they can sink their spiritual teeth into and build their eternal lives on, are leaving their life-long denominations due to the lack there, of anything more substantive than the man-made and shifting sand doctrines that are being constantly re-shaped by the cultural tides swirling all about them (Matthew 7:21–27). For those of our friends, neighbors, families and co-workers who find themselves ever more awash in such soul-confusing and chaotic winds of changing doctrines, they desperately need to be exposed to the following: the refreshing, Scriptural, and soul-saving stability, of the one, original, biblical church as seen in Scripture. The one church of Christ (Romans 16:16) that has not for two millennia; does not now in this community; and will not ever, ever — no matter what — compromise with culture, or be willingly led astray by man-made follies and philosophies! Because it both was, and is, built, and stands: solely, soul-ly, solidly and ultimately securely, upon the solid-rock truth, of the word of God (Matthew 16:18–19). When they are ready to stop “playing at church” and get serious about God, then it’s time for them to come and see us. 1). When they are ready to stop “playing at church” as it pertains to their commitment to Christ. Christ calls His people/His church to complete commitment to the will and word of God (Mark 8:34–38; 1 Peter 1:13–4:5). Nothing less will do. This is not a game. This is not Roman Catholicism wherein as long as you confess your sin and continue to contribute financially, you can arbitrarily continue in sin without consequence (Romans 6:1–23). 2). When they are ready to stop “playing at church” as it pertains to the entertainment mentality that is absolutely ravaging and completely consuming so many man-made religious entities today. Our Lord could not have made it any clearer that His people are to be “making the most of the time” He has given us to learn God’s word, and not wasting a second of it on anything else or less: See then that you walk circumspectly, not as fools but as wise, redeeming the time, because the days are evil. Therefore do not be unwise, but understand what the will of the Lord is (Ephesians 5:15–17). This is why we in “churches of Christ” (again, as seen in the Scriptures — Romans 16:16) seek to make the most of each and every opportunity to get together and actually open up and study the bible (2 Timothy 2:15), instead of wasting precious bible study time pursuing, promoting, and participating in pointless entertainment (Romans 13:11–14; 1 Peter 4:1–5; 2 Peter 1:2–11). 3). When they are ready to stop “playing at church,” as it pertains to the biblically unauthorized, unwelcome, and sinful, infernal, addition or infusion of mechanical instruments of music into God’s original, New Testament, worship pattern. Eight times total in His New Testament, God specifies the exact kind of music He demands, desires, and therefore deserves from His obedient children as their God and Father in heaven: SINGING & SINGING EXCLUSIVELY! Check them out: Matthew 26:30; Mark 14:26; Acts 16:25; Romans 15:9; 1 Corinthians 14:15; Ephesians 5:19; Colossians 3:16; and James 5:13! And then, note this: Where is the ‘instrumental’ in any of those musical passages? The same place as the sinner’s prayer of faith for salvation is found in the word of God; as well as the same place instruments will be found in the faithful house of God (1 Timothy 3:15): NOWHERE! 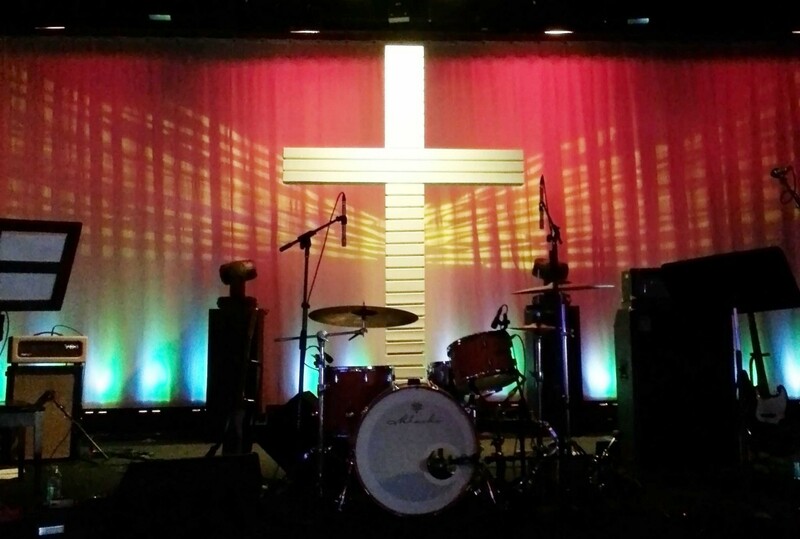 Let your ‘fed-up-with-false-and-surface-religion’ friends and neighbors know: When they’re ready to stop playing at church, there’s a place where they can experience pure, God ordained, Spirit and truth worship, and so become the kind of worshippers the Father is right now seeking (John 4:23–24). And that is by humbly and obediently worshipping with His church, as seen in His word.